This stunningly beautiful and informative book celebrates the Arctic, one of the last great wildernesses on the planet; a place where animals have survived for thousands of years protected only by fur and feathers. Humans also survive in the Arctic, but only those who have adjusted to the climate over millennia and who clad themselves in the skins of the animals they hunt. For the casual visitor, this is a place where survival for any extended period requires taking advantage of the best that modern technology can offer. But the rewards are immense: the Arctic can be harsh, but it is also stunningly beautiful – days during which the sun glints on ice, nights illuminated by the ethereal dancing light of the aurora and with a glimpse of some of the most remarkable animals on the planet. Many travel to the Arctic to see the animals, the land mammals, the whales and seals, and the birds. However, the Arctic also has an absorbing human history. 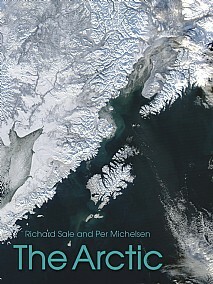 The origins of the Inuit in North America, and the array of Eurasian northern peoples, from the Sami of Scandinavia to the Yuppik hunters from Asia’s Bering Sea coast, are still debated, while the discovery, just a year or so ago, of the second ship of Franklin’s doomed expedition to find the North-West Passage has reopened the arguments over exactly what did happen to more than 100 Royal Navy seamen. The Arctic provides not only an understanding of the formation of the Arctic but the science of snow and ice including the phenomena of aurora and parhelia, and the way in which the area’s wildlife contends with the chilling harshness of its climate. This fascinating, magnificent area is now under severe threat. Global warming is causing the sea ice to shrink, in both area and volume. This allows easier access to its probable resources and, ironically, this access merely adds to the threats to the area and its wildlife. Due to feedback mechanisms, the Arctic warms about twice as fast as the Earth. The area therefore acts in the way that canaries once acted in coal mines, giving an early warning of danger: melting sea ice not only threatens the local wildlife but indicates the threat to the Earth as a whole. This is a truly remarkable book encompassing the diverse facets of this magnificent area and its vital importance as an indicator of the planet’s health. This stunningly beautiful and informative book will be of immense appeal to anyone with an interest in the polar regions, wildlife, conservation, nature and maritime history.